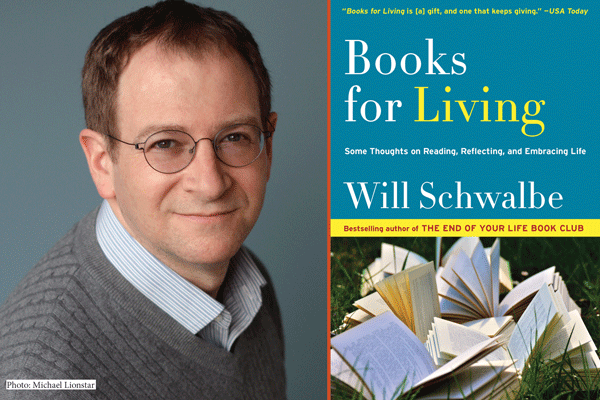 Writer and journalist Will Schwalbe is the author of The End of Your Life Book Club, which spent twelve weeks on the New York Times bestseller list, was an Entertainment Weekly Best Book of the Year, one of Amazon’s top four best books for the year, an Indie Choice Honor Award book, and winner of the Books for a Better Life Award for Best Inspirational Memoir. His latest work, Books for Living, was a finalist for the Lambda Literary and Publishing Triangle Awards, and illustrates the ways in which books affect us, honor our loved ones, and add meaning and fullness to our lives. Schwalbe has an impressive career surrounded by the written word. He has worked in publishing (he’s now EVP, Editorial Development and Content Innovation for Macmillan); digital media, as the founder and CEO of Cookstr.com; and journalism, writing for various publications, including the New York Times and the South China Morning Post. Schwalbe is a self-proclaimed New Englander, and a life-long book lover, with early memories of the books his parents would read aloud. He currently lives in New York with his partner David Cheng.